Remember that German cousin who I didn't know the name of way back 'In Loving Memory of Mum Pham' (which turns out he took those photos of us that Mum loved so much when he was learning photography)? I never fully understood why he was in a bunch of our Phamly photos in Germany. Until now. We recently connected over Facebook (I know, using FB for something other than memes and cat videos - crazy), and I asked if he was up for being the first person I've ever interviewed for my blog. He accepted and proceeded to make me cry like a baby learning things I never knew about my cousin nor my parents. Where did you grow up in Vietnam? Do you miss it? Were you close to my Dad back in Vietnam? As your dad lived in Nha Trang, we were not as close to each other. Actually, we didn’t have as much contact. The last time he came to visit my family in Saigon were 1975, short before the takeover of the southern Vietnamese capital by the Communists. Dad Pham fled from Nha Trang after his city was taken-over by the Vietcong. The south Vietnamese army was broken. He came with a gun in his jacket and told us, some people on the street tried to rob him. He smiled at them, showed the gun and asked if they wanted some bullets. The robbers fled. Do you remember the war and the Viet Cong? I didn’t remember much about the war and the Viet Cong. What I remember quite well was the time after the takeover: troubles with the Viet Cong authority, the hunger, ridiculous things we were forced to do, etc. How did you end up in Germany with my parents? How did you feel when you learned your parents were sending you over first? My parents’ plan was actually not to send me abroad first. The plan was that I left my family forever. No one knew at that time that things would turn out the way they have. We didn’t know about the German program for family reunion. We didn’t know that the Vietnamese government would allow my family later to leave Vietnam legally. So, you may imagine how I felt when my parents asked me whether or not I wanted to take the chance. The decision to leave was not easy for me. “Legally crossing the border” was the common term used in Vietnam in the time period when Vietnamese people of Chinese origin were hassled and forced to leave Vietnam. They were allowed to “escape” the country on boats after paying a huge amount of money to the government and, of course, also to some corrupted people working in the government. A colleague and friend of my father (I called him chú Kiêng) changed his name to smuggle his family to the list of the permitted Chinese. He took me with his family (my family name was also changed to Quách) and we escaped Vietnam that way. Some others like your Dad did it illegally by leaving the country by boat without permission. I guess he was picked up by a German ship and came to Germany in around 1978. I’m not sure how long it really took. We were placed on the bottom of the boat near by the motor which ran all the time (when it was not broken down). There was no daylight. It was dark, loud, and sticky. I think it was roughly a week or so until we arrived in Malaysia. We got robbed by Thai fishers twice. The Malaysian marine didn’t allow us to enter their territory. So, they towed our boat to Indonesia. Upon arriving in the first refugee camp on a small island of Indonesia called Araya, I contacted Dad Pham by sending him a short letter. I still remember how happy I was when I held his reply letter in my hand after some months. And I was even happier when I opened it and found an entrance clearance for Germany and a 100-Dollar banknote in there. 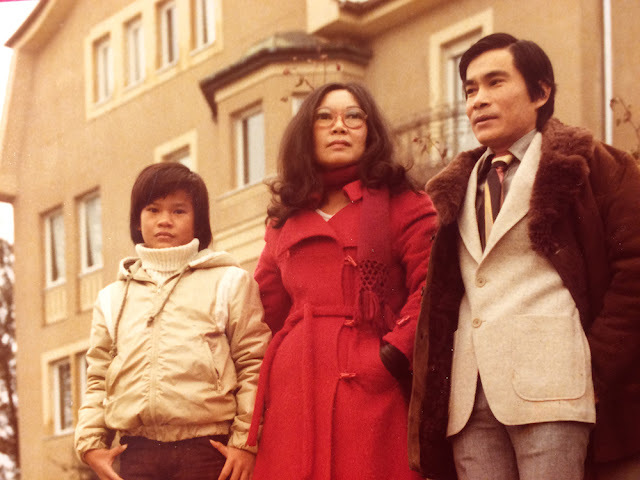 With the 100 Dollars in my pocket, I left chú Kiêng’s family to go to another camp for Germany. I guess, with this decision I caused a lot of trouble to chú Kiêng, since he had been declaring me as his own son in his application for the U.S. He was about to get the entrance clearance for U.S.A. after being interviewed by the US delegation. Now, chú Kiêng had to explain why his son has left him for Germany. I was really sorry for this. But I think it was the right decision. From then on, I really travel on my own. I needed to find another refugee camp, which organised flights to destination countries for refugees with such a document Dad Pham sent to me. 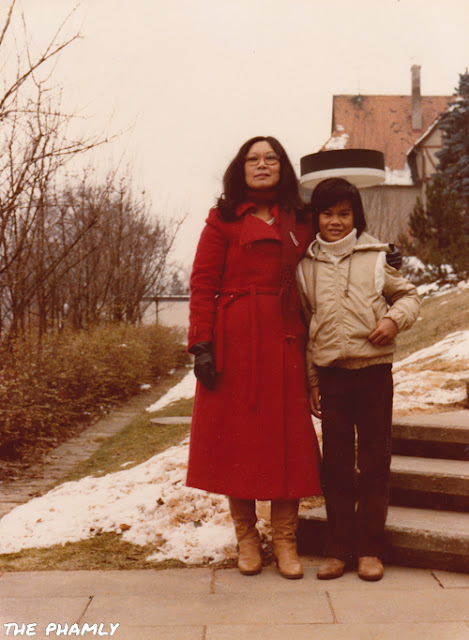 I visited 3 other camps (Galang, Pynang, Jakarta) before arriving in Germany in January 1980. When did your family come over to Germany? What was your reunion like? My family came to Germany 3 years later. I still remember how happy I was. I couldn’t sleep the night before their arrival. For me, it was kind of wonder since I never thought we would see each other again when I left Vietnam. Dad Pham had a big contribution to our family reunion. He took care of my application and the administrative things. He helped me to send money and “survival” packets to my family. Life wasn’t easy under the Viet Cong regime. And my parents had to feed 9 hungry mouths (my 6 siblings and the other 3 cousins living in the same house). Without support from abroad, they would not be able to do so. Sometimes, I wonder what life would have been like if Mum & Dad had stayed in Germany. Do you ever wonder what life would have been like if you had stayed in Vietnam? It’s very interesting. Very often, I ask myself the same questions. What would have been if I decided not to leave my family and stayed in Vietnam. Or, what would happen if Dad Pham didn’t send his letter and the entrance paper? I would come with chú Kiêng’s family to the US. But what would happen with my parents? One thing is for sure: If Mom and Dad stayed in Germany, you would speak German very well and would know me better. And Dad and Mom would still say “Herr” (Mr.) and “Frau” (Mrs.) to each other J. Actually, how did they call each other in Australian? Did they tell you the anecdote about “Herr” and “Frau” instead of “Anh” and “Em” like other Vietnamese couples always do? Mom Pham told me once that Dad called her “Chị” the first time they met. Dad Pham meant it with respect. Mom took it like dad is too young for her and called him “Em”. After the marriage, they agreed to be “neutral” by using the German words for Mr. and Mrs. when talking to each other. Here ends the first part of the interview. The rest will come in Part 2. FYI - Mum & Dad Pham continued to call each other Herr and Frau to the end of their time together. I never knew the origin of their German nicknames for each other.